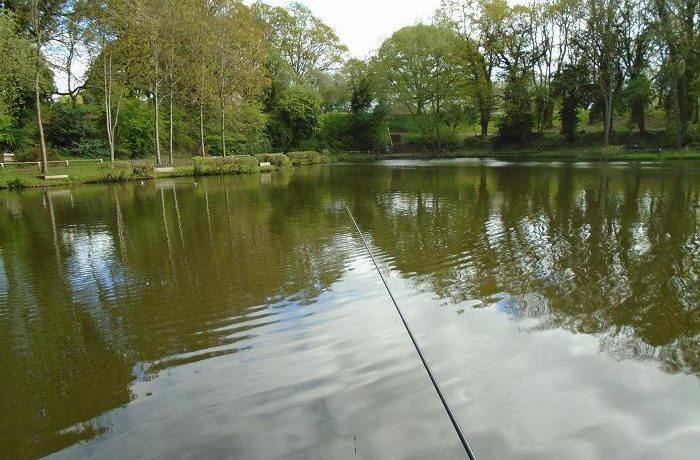 A first visit to any new fishery has an element of wonder and armed only with information from the club secretary, that I would catch on the pole with bread punch, I let myself through the combination controlled gate to follow a wooded footpath leading to the bank of a secluded lake. First sight filled me with apprehension. There were literally scores of double figure carp cruising around, not my target fish today. 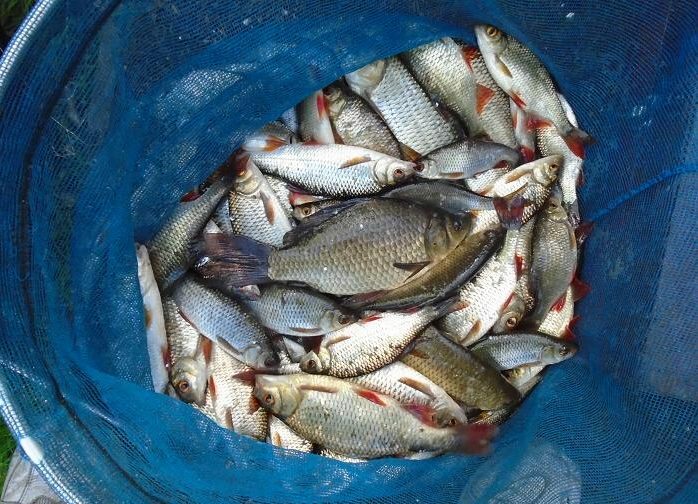 I was hoping to be taking roach and skimmer bream on the punch and did not fancy getting tangled up with any of these monsters, the only safety net being my heaviest 12 -18 size elastic through the top two sections of pole. A 16 g antenna float rig with 2 lb hook line to a size 14 barbless was looped into the stonfo connector at the pole tip and I plumbed the depth, finding 4 feet at 2 metres, dropping to 5 feet deep at 3 metres. I wetted down half a pint of liquidised bread, dropping two squeezed up balls in at the drop off and another a metre further out. With the pole at 3 metres, I swung out the rig with a 5 mm pellet of punched bread and watched the float settle, then lift again, before steadily drifting away and down. A lift and the elastic bounced out of the pole tip as a nice size rudd fought below the surface. This was a good start. A few more like this one would not go amiss. Another pellet of bread on the hook and I swung out again. An identical bite, a lift of the float, followed by a slow sink away. I raised the pole to set the hook into solid resistance, the elastic now stretched down to the surface and continued out slowly, the pole taking on a bend as the unseen fish thumped rhythmically away on the hook. This had to be a large bream and I added another length of pole to allow me to follow the fish. There was a deep bronze flash beneath the surface, as the elastic exerted maximum pressure. The fish went deep again, swimming toward me and I unshipped the extra metre of pole. It ran out again and I pushed out the landing net as it rolled on the surface. Now on its side, I raised the pole putting more pressure on the bream and it slid toward, then into the net. Phew! It was on the bank. The hook was just in the side of the lip, pushing out easily with the disgorger. 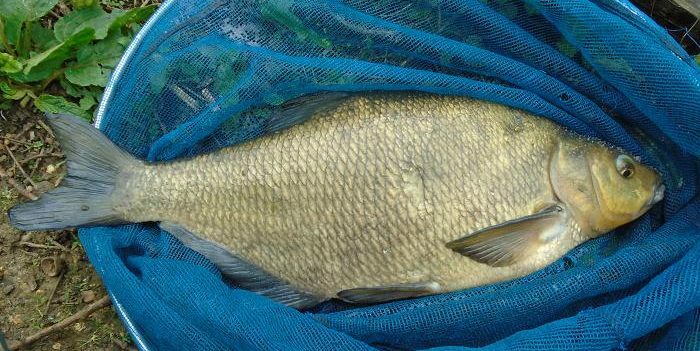 A big male, this bream had white spawning bumps, calcium tubercles covering its head and shoulders, ready to defend its territory from other males, that try to intrude on its harem of spawn heavy females. What a lump, this beast pushing the scales round to 5 lb 12 oz, before I carried it in the landing net to a spot twenty yards along the bank, where I released it. After the commotion of landing the bream, I dropped another couple of feed balls over the drop off and cast out again. The float settled and sat there for five minutes. I lifted out to check the bread. It was still there. Any rudd, or roach would have taken it by now. I swung the bait out again. The float bobbed, then disappeared down a hole out of sight. The elastic was already coming out as I lifted. Grabbing another length of pole I followed the elastic. Whoa! This fish was shifting. It must be a carp? It then changed direction, boiling the surface. A flash of gold as it reversed again briefly showed a good tench. I hung on, balancing the pole, trying to keep the tip high, the elastic taking the heavy shocks. I’m sure that on a rod and line, I would have been broken by now. The runs slowed and the tench was on the surface and soon netted. I am not known as a big fish angler and needed to get my breath back after this big female. Once again the hook was just in the lip, this time in the hard tip of the nose. Leaving it in the landing net, the weight was exactly 4 lbs and again carried it away from the swim for release. A cup of tea and a bite of sandwich was needed. Wiping slime from the line and the shot, I was ready to see what else was on offer, following another couple of feed balls with the float. The antenna sank, then popped up again before I could strike. The float sat still. The bait was gone. I went up a size of punch to 6 mm and double punched a thick pellet then recast. The antenna raised and lowered, then lifted, moving slowly off, sinking away again, until out of sight. A sharp raise of the pole pulled out the elastic again, but this time no explosion, just a steady pull toward the centre of the lake. Another bream? No, the fish suddenly woke up and began to fight its corner, head shaking as it ran, taking out the elastic in spurts, while I added another two lengths of pole to follow its every move. It was being drawn closer as I removed the pole sections again, passing deep across the front of me, but surfacing at the end of its run. An even bigger female tench now lay ready to be netted. Weighed in at 5 lb 8 oz, this was a new personal best for me, the fact that I also caught it on a so called small fish method, pole with bread punch was an added bonus in my book. I had decided that this and any other large fish would be returned immediately, rather than put in the keep net, avoiding a slimy net being paramount. The next bite slid away to be met with another explosive reaction from a much smaller, but hyper active male tench that dived and rolled around the swim, until exhausted. At 2 lb this big finned male seemed like a tiddler in comparison to the previous pair, although what he lacked in weight was made up in sheer muscle power. I was now ready for anything and when the float sank away again, I guessed it was another tench, larger than the last and just as energetic. To my right was a lily bed and this one kept powering toward it, despite putting on side strain, the elastic following it all the way, until it was in the roots. Several times I tried to pull it free, but each time the lilies pulled back. Time to slacken the line and wait for the float to move off. Minutes later the float tracked away from the bed as the tench swam out of hiding. A long hard pull and the fight was into round two, the tench out for the count, after a few short runs. This chunky lump of solid muscle weighed in at 3 lb 8 oz. Tench have always been a favourite, the first day of the coarse fishing season on June 16th, being celabrated as a lad, by getting up at 3 am to cycle to the local canal, catching maybe half a dozen tench of a pound on bread, packing up by 7 am to cycle to the newsagents, where I would rush through my paper round, before heading off to school for a sleep! It was time to top up the liquidised bread feed, have another sandwich and pour more tea, as I was beginning to flag. This was too much excitement for one day. Rested, I cast out again for the latest instalment, what next? I did not have long to wait. The float dithered, then sank slowly away and I lifted into another big bream with its slow thud, thud fight, the elastic again doing its work, all I had to do was hang on, following each move with the pole, until ready for the net. Across from me, another angler had hooked a fish as I cast out and was still playing it on rod and line, while I had netted this 4 lb 8 oz bream, weighed it, returned the fish, then rebaited, before he had his landing net out for another large bream. Bubbles were still bursting over my baited area, when I lifted into another big bream, that kited toward the middle, it being a matter of time, before, on the surface, the net slipped under it. Full of spawn and round like a dish, the scales dropped to 5 lb 8 oz, this female almost equaling the weight of the first today. Time was now getting on, this had only been intended as a taster session, but there was still time for one more cast and rebaited, the rig was swung out again. They were still feeding, the float taking time to sink out of view and yes, another big bream was steadily pulling out the elastic toward the middle, using its weight to surge away. 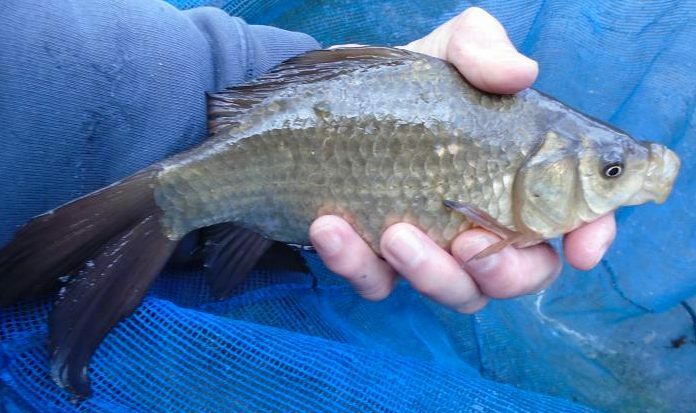 In a match I would have be trying to get the fish on the bank as quickly as possible, but catching bream is almost relaxing, once hooked in their tough mouths they tend to stay on and it is worth waiting for them to be ready for the net. Last of the day at 5 lb 4 oz, this was another fatty ready to spawn. I am sure that I could have sat there catching these and more tench for the rest of the afternoon, but that would have to wait for another time, it was time to get out in the motorway traffic, before the rest of humanity. 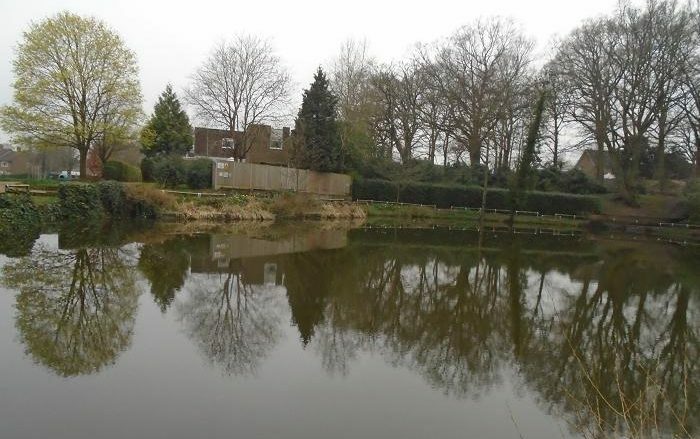 With Braybrooke Park’s Jeane’s Pond closed for a month at the end of April, I took advantage of a dry weather forecast to fish it this week. Set up by 10 am, I was keen to find out if the warmer weather would mean more and better fish on the bread punch and set myself a target of at least ten pounds for the five hour session. 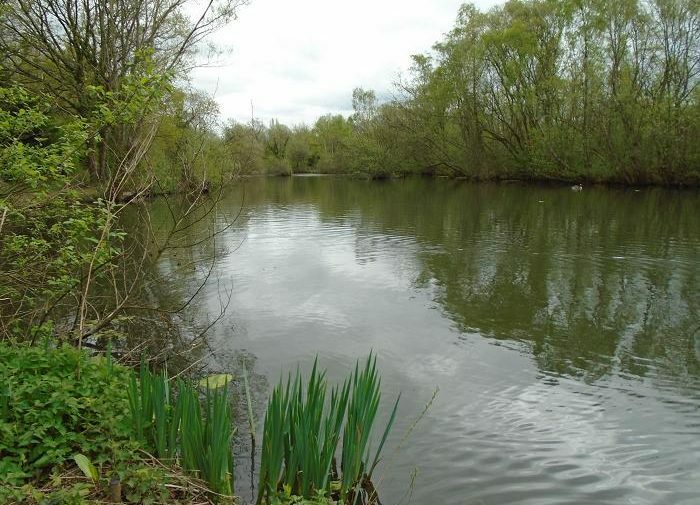 Conditions were perfect with a slight breeze ruffling the surface, the pond having a healthy green tinge. Being cold and wet overnight, I had overdressed and was feeling the warmth of the sun already. Considering taking off my hooded jacket, the float sank away and the No. 5 elastic on my pole stretched out as the first fish of the day came to the net. I never got the chance to take off that hoody, as the bread punch worked its magic and I got into a catching rhythm. 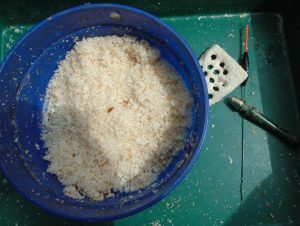 Targeting the better fish, I was using coarse ground bread crumbs, wetted down to sink quickly and spread out near the bottom. Starting off with a 5 mm punch to a size 14 hook, the bites were confident, usually sinking as the float cocked, the larger hook allowing the average 3 to 4 oz fish to be swung to hand with three metre length of pole. 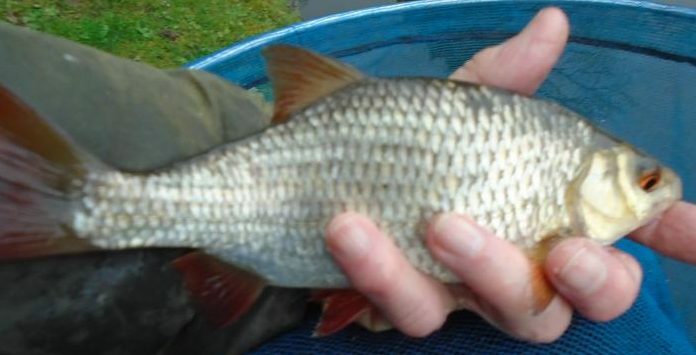 The roach were outnumbering the rudd, more fish needing the net as the first hour progressed and I was confident that my 10 lb target would be reached. 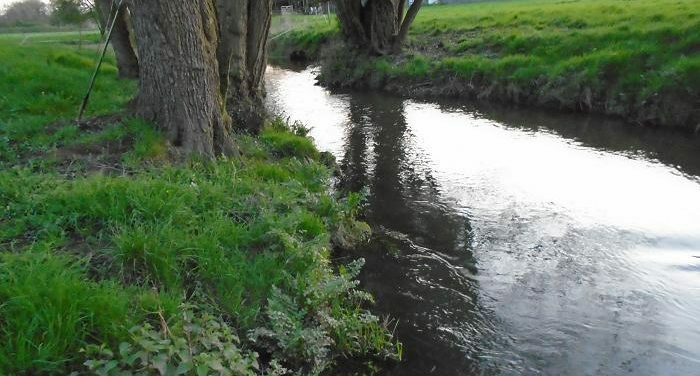 I had plumbed the depth before I had started and found a drop off 3 metres out, where I fed a pigeon egg ball of feed every 15 minutes, fishing to one side or the other of the feed. This was working well and quality roach and rudd were now the norm. 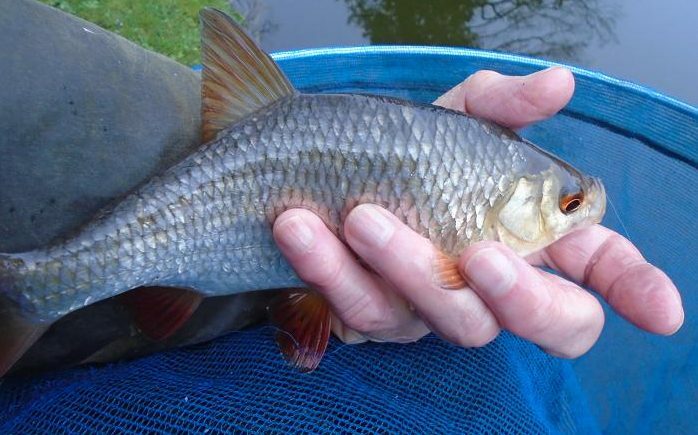 This was a fin perfect roach, while many of the rudd were quite tatty, having dropped scales, although their fighting qualities were not affected. 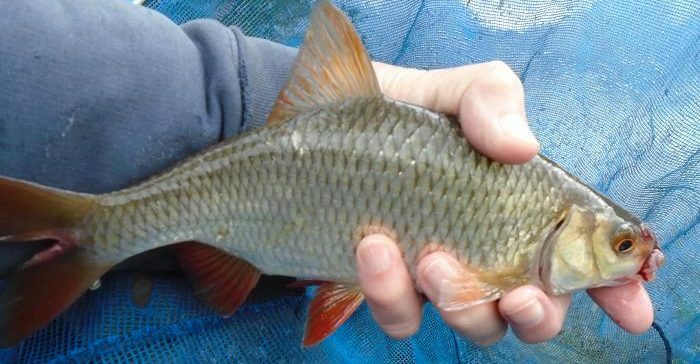 Other rudd were perfect, as the one below shows, having golden scales and bright red fins. With little warning the wind got up and the heavens opened. This was not part of the script. I was thankful that I had not taken off the jacket, pulling the hood over my cap, but it was not even shower proof, my bait apron acting as a temporary buffer between my jeans and the downpour. In seconds the bread punch slice was soft and useless, but all was not lost as I keep the spares in a polythene wallet. It was a case of, “batten down the hatches” and wait for the storm to pass, which it did after five minutes. My wife shopping only a mile away never saw a drop. April Showers? The sun was soon out again and the quality fish kept coming. I topped up the bread feed and changed the feed pattern as small fish were now forming a barrier between the upper surface and the bottom. I now fed two lines over the drop off, two metres apart, still only a pigeon egg size ball every twenty minutes, but staggered between the two feed areas. 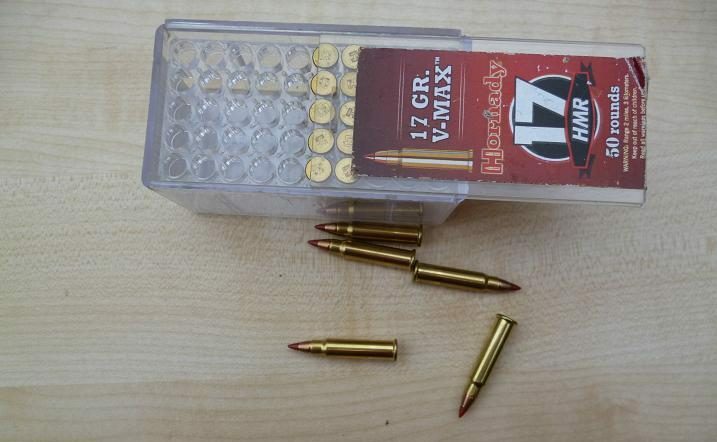 I also went up to a 7 mm pellet of bread. The good fish were still down there, fishing away from the fed area, while the small fish were preoccupied over the feed. This roach had a badly damaged lip. It is barbless hooks only on this pond. Somebody is not aware of the rules. The previous captor had ripped the hook out. 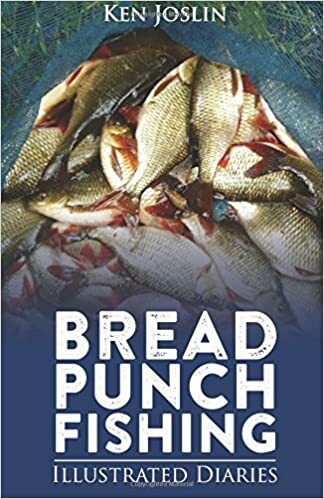 The bites were now slower, the bites steadily building until the float sank from sight followed by the line, each lift of the rig seeing the elastic come out as yet another good fish fought for freedom. One such bite saw the elastic stretch away and I was convinced that I hooked a tench, the fish making long runs, until it surfaced like a submarine. It was a fan tale crucian carp, a rarity in this pond. Another fine, hard fighting roach came to the net. Despite the slow bites, these were all just hooked in the upper lip, the hooks often transferring to the landing net. This was the last of the day. The rig snagged on vegetation at my feet and pulled free, the float and line spun round the pole tip. Not the first time that a bird’s nest had cut short my fishing. I had lost my first rig up the tree to my left, when the hook had pinged out of a fish in the landing net. Now my spare was gone too. I had another rig with a slightly heavier float, but it was close to my 3 pm deadline and I called it a day. It was obvious that I had easily topped my 10 lb target weight for five hours and when my 14 lb limit scales bottomed out, I reached for the 50 lb set. These swung round to 17 lb 8 oz. A foreign lady watched with her children as I weighed these up, she taking a picture on her phone for husband, who also fishes with bread she said. “Are you going to eat any of those?” she asked. “In our country we do, but in England you throw them back” Yes we do. Spring shook off its winter chill with a shift of wind from the south and clear skies, that saw temperatures in the high twenties, which had BBQs across the land dusted off and fired up, but I was making plans for a visit to my syndicate trout stream, shielding my eyes from the evening sun, as I headed west. Arriving after 7 pm, the air was full of flies, but there were no signs of rising trout as I searched known holding areas for fish. Although running high and fast, the river was clear, which gave me some heart to keep casting the gold head Hare’s Ear nymph, expecting at any moment the sudden movement of the leader, that would indicate a take. Continuing down the bank I almost trod on a well pecked perch of about 12 oz. Could have been a mink, or heron kill. Shame. 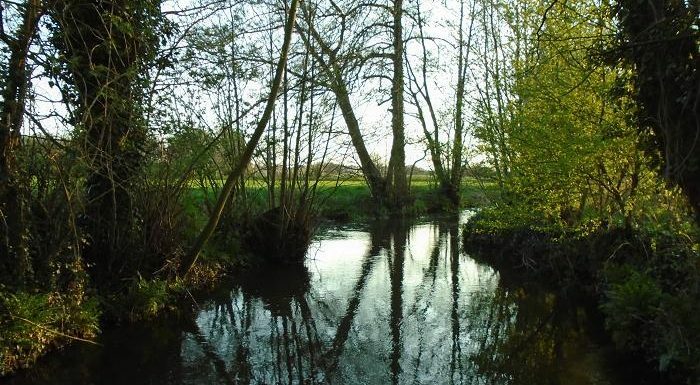 With mink, heron and crayfish in abundance, fish have an uphill struggle to survive. Twenty years ago the occasional trout taken by a heron would not have been missed, but now invasive species thrive. We are fortunate that there are no cormorants on the river. 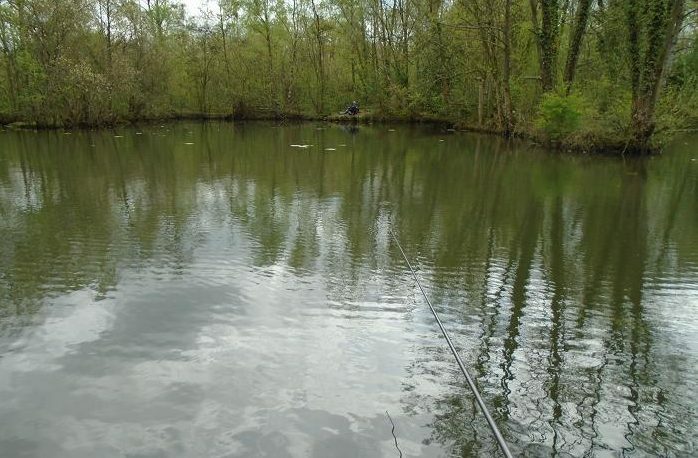 Having drawn a blank at another once productive pool, I continued down and saw a rise in a back eddy close to the bank. At last a fish. I didn’t care if it was a dace, chub, or trout, something had risen to one of the many flies lifting off. There was hope yet. I circled away from the bank to come up from behind and waited for a repeat performance. Nothing. 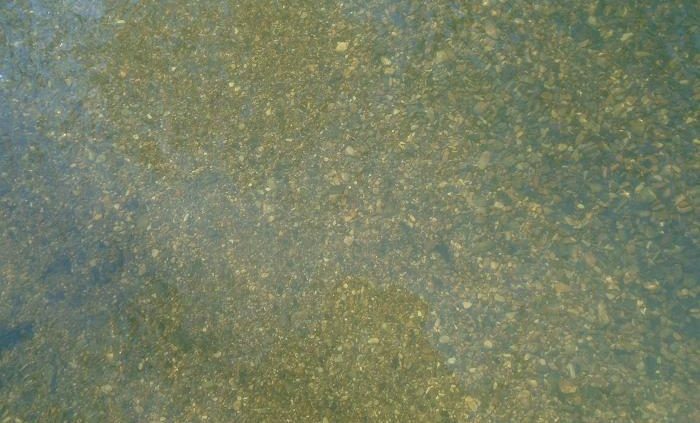 This pool has provided three or four trout in a single visit before, but now, as I worked the nymph up the river my enthusiasm waned again. The light was going and returned back to the van seeing no other rises. Two days later the warm weather had continued and I was back at 5 pm, intending to fish upstream of the road. While pulling on my waders, I saw another syndicate member plodding his way back to the road and waited to pick his brains. It was Richard, who had fished two miles down and back again, most of it wading. He looked shattered. 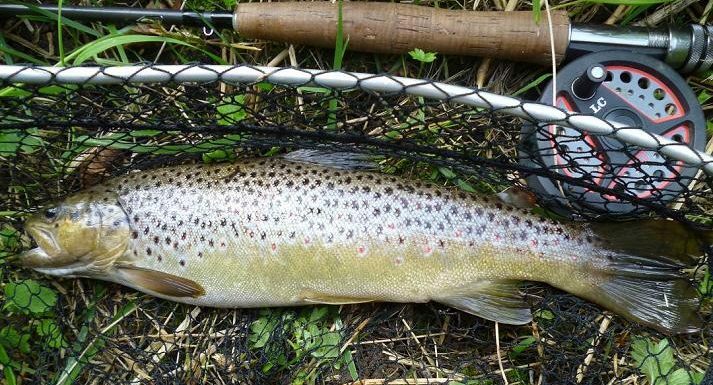 His report was no rising fish, but four trout lost, one chub and a ten inch wild brown, all taken on gold head nymphs. He had a picture of the trout and it looked fat and healthy. 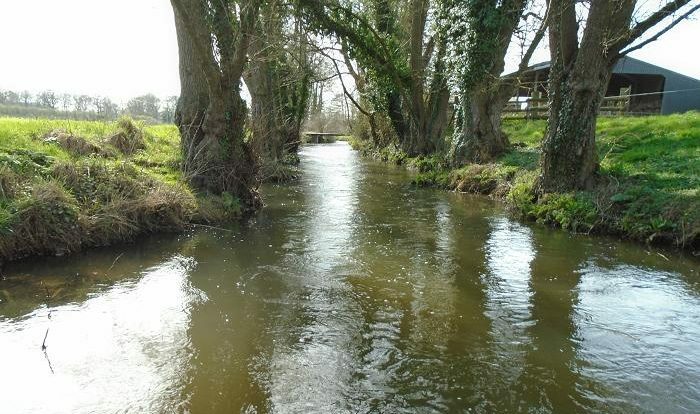 The river looked perfect as I waded up from the bridge, the gravel was clean and bright, offering plenty of deep runs and eddies to cast my gold head Hares Ear into. A black cloud was gathering to my left and brief showers swept across the river, but I continued my routine, wade a yard, cast ten yards, watching the greased leader come back on the retrieve. A few more casts to cover the water in front of me, then wade again. The leader shot upstream! Missed it. My heart jumped. That was a take! Recast to the spot. Nothing. Further up, last year a work party had constructed a water deflector using willow, which was now rooted and sprouting. A deep run had been cut in the gravel by the force of the river and I cast to the side of it. The leader jerked upstream and my rod bent into a fish, not a big one, but the gold flash ahead said it was a trout. It cartwheeled across the surface, then rushed down below me. Only ounces, it powered away, bending the rod until in the net. 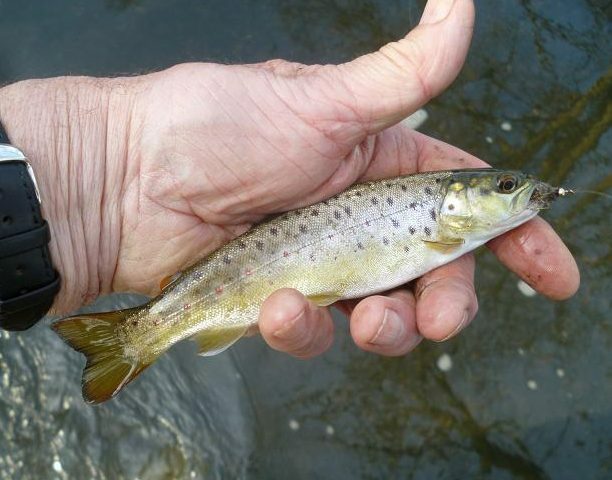 More powerful than a roach twice its size, trout like this are proof that the river has the ability to regenerate itself, despite some of the perils that it has faced in recent years, drought, nitrates, predation and poaching. 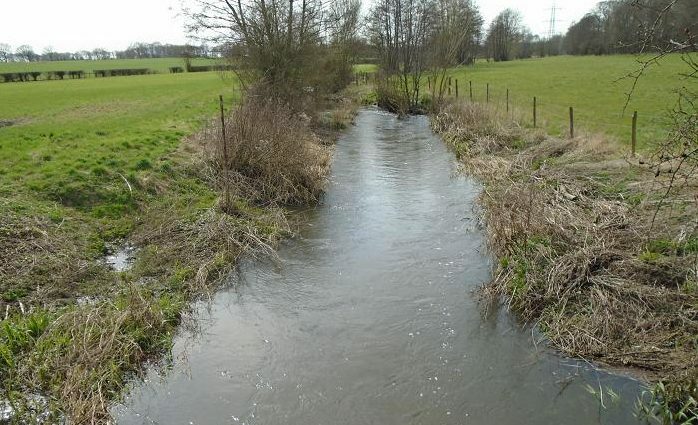 The syndicate have a set program of river improvements and weed planting, that we hope will return it to the form of just a few years ago. To the west the sun was still bright, but to the south that cloud was drawing closer and a heavy shower forced me from the river back to the road. A rainbow stood out against against the cloud. If I had been a photographer and not a wet angler, I would have paused for that classic shot, but then who but an angler would have there anyway? 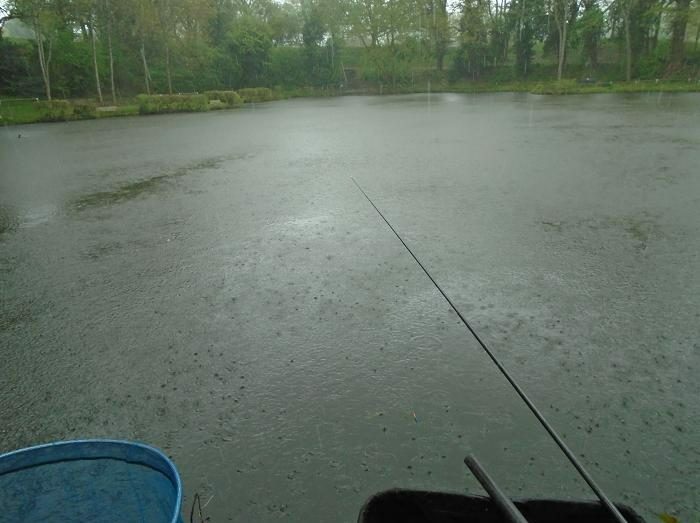 A last minute change of plans left a few hours free for fishing this afternoon, although a rain shower as I loaded up my tackle gave me second thoughts. The day had dawned grey and misty, but a sharp, cutting wind from the east had blown that away, bringing brief showers and drizzle. With top to toe thermal insulation and a waterproof jacket, I was ready to face the unseasonal elements at Jeanes pond in Braybrooke Park. It was not exactly blowing a gale when I arrived, but it was drizzling with fine rain for the first half hour as I set out my stall to fish and after making sure that all I needed was to hand from my tackle box, with my jacket hood over my cap, I settled down in my own cozy little world. Plumbing the depth, I found that the inside shelf fell away to 2 metres deep, with just the top two sections in place, ideal for some close in fishing with the bread punch. Hoping to target better sized roach and rudd close to the bottom, I soaked my bread crumb feed, to allow it to sink quickly through the top layers, where the small stuff live. A couple of balls of the sloppy mix were dropped over the shelf, followed shortly by the first cast of the afternoon. The float settled and sank away, lifting into a three ounce roach. Small, but perfectly formed, this would do well for a start. The next cast saw the pole take a set, as the No 6 elastic was pulled from the top two sections. Ah that’s better, a solid roach failing to shake free the size 18 barbless. Another ball of feed and they were queuing up for the 5 mm pellet of punch bread. 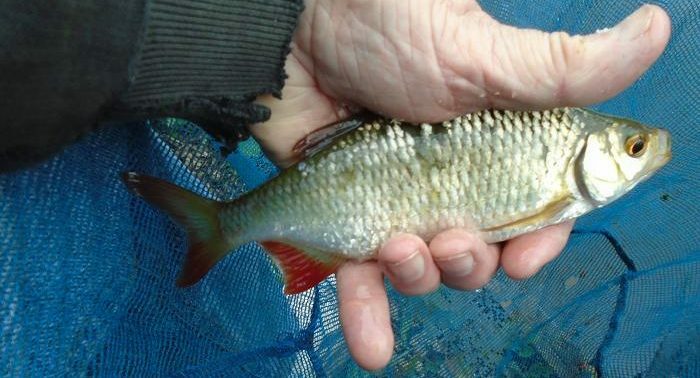 What a clonker, this roach/rudd hybrid started with a slow thumping fight that ended with the fish dashing in all directions, the elastic cushioning the runs as I followed it with the two metre section of pole. Another monster from the deep at my feet, the mouth said roach, but the body said rudd. The one below was a definite rudd, the missing top lip a common sight on this pond. The inside line continued to provide plenty of action, just the occasional small ball of feed keeping them interested. Still they came. The bites took their time to develope, slight dimpling of the float resulting in the steady sink of the tip, each fish lightly hooked in the lip, most dropping out in the landing net. After an hour, the bites on the inside slowed and I fed a few small balls of feed further out, fitting another length of pole on to fish at four metres . The first cast at four metre brought another clonker, that fought all over the swim, the net coming out for most fish. 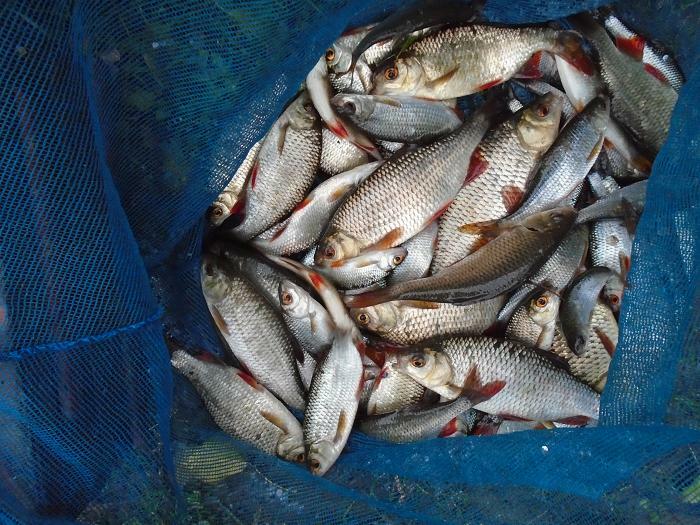 Back in the groove again the net began to fill with quality roach and rudd. I had used half a pint of feed and wetted down another quarter, putting in another three balls at four metres. This was too much as smaller roach and rudd began taking on the drop, causing a few missed lift bites. Shallowing up the float brought faster bites, but smaller fish, getting one a minute. I stopped feeding and set the float back to two metres. This did the trick and I was back among the quality fish, this ragged lipless wonder fighting deep, until ready for the net. This was the last of the day, I had punched my way through half a slice of bread, counting over 60 holes and guessed that I had about 8 lbs, the scales being the proof of the pudding at 8 lb 8 oz. A few days of warm dry weather, saw the flood level dropping on my syndicate trout stream this week, but with heavy showers forecast to follow, it was now or never and I loaded up the van for my first visit to the Hampshire river today. Just two weeks ago I stood at this spot and watched a snow blizzard blowing horizontally across the river. Spring is creeping into gear, but two days of temperatures in the low doubles is not going to make much difference. 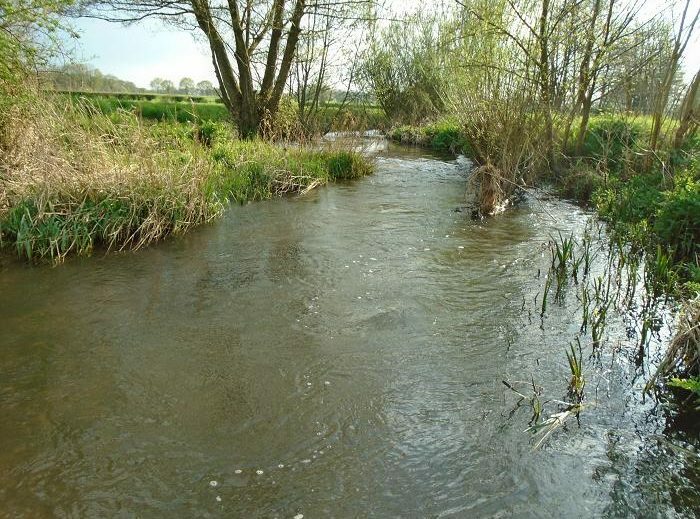 The river was still carrying surplus water, but the gravel was clean under my waders as I worked my way upstream to a favourite pool, watching the line for tell tale movement, as my gold head Hares Ear bounced along the bottom back toward me. This pool and the one above have given me some early season sport in the past, but today nothing was happening. More swirling water, the expected Grannom flies swarming just above the surface absent, as I cast the gold head nymph to all the likely and not so like spots on the river. Looking down the gravel was clean, washed by regular flood water this winter. A good sign for fly life hatches later on. 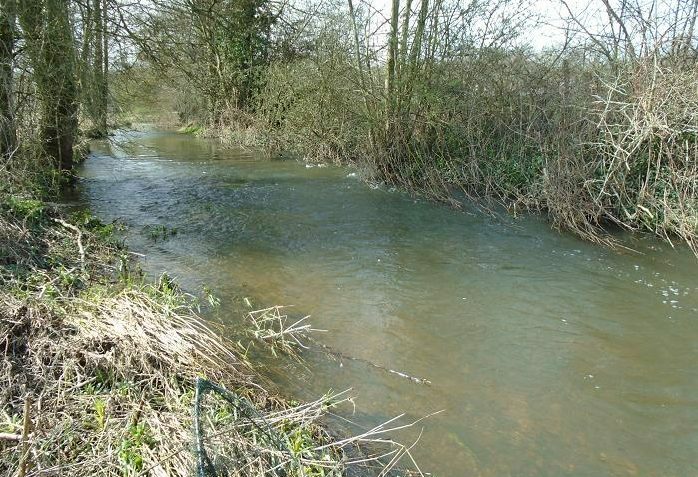 Once again no sign of a take, but it was good therapy just standing in the flow pushing the fly line out with my 7 foot No 3 weight rod, against a gusting downstream wind. Further down I met three of the syndicate’s bailiffs, trying to catch up on cancelled work parties, cutting out trees to form more flow deflectors to be put in place later in the year, when the levels drop back further. 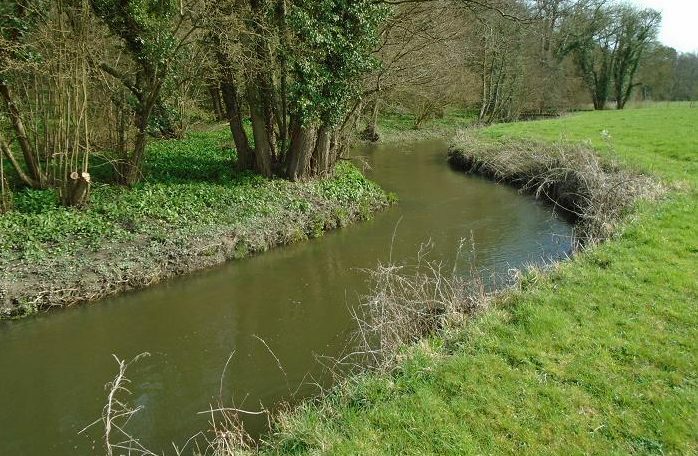 Talk was of more fish to be stocked and weed to be sourced to provide a better habitat. It is early days yet, spring may be late with no sign of fly life, but nature has a habit of making up for lost time. Another two weeks could see a trout rising at every corner. As anglers we live in hope of better days. A true wild brown trout taken on an early season visit a few years ago, when this little river was full of surprises. With the possibility of more snow, but the certainty of rain for the rest of the week, I made the effort to find time to visit my new permission this afternoon. 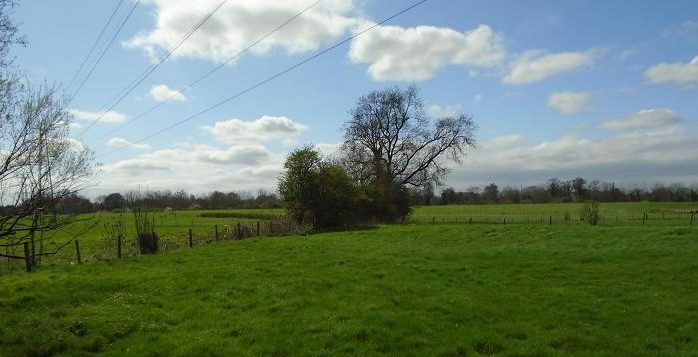 The farmer would like to put his cattle onto the new grass early next month, but too many rabbit burrows on the land are causing him concern for the beast’s well being. At the beginning of this month he had gone over the land with his digger, flattening and filling as many burrows as he could find, but another dozen have reappeared in that time. Driving toward the farm, four rabbits were clearly on view at the base of one of the electricity pylons, but crossing the field in their direction, the flashing of white tails meant that they would be safely underground, before I was anywhere in range. Circling round to the left, I found a depression in the ground which offered a degree of cover about 80 yards away. Later in the year this will be a patch of stinging nettles, but today they were immature plants, which proved they were still capable of making my palms itch. Adjusting the rifle bibod up another few inches allowed a view of the pylon base with its bramble topping and I settled down to wait for some movement. 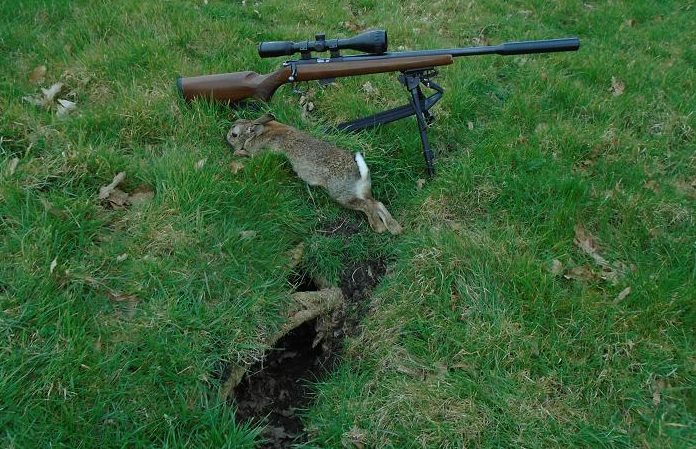 In full view of cars passing along the lane, but shielded from the pylon, I lay prone until a rabbit emerged from a burrow, its head and shoulders clear, when I squeezed the trigger. With no time to wait for more rabbits, I paused to note the number and depth of the burrows, some appearing to continue straight down for six feet. Picking this one up, I made my way back across to the centre, where a fallen tree gives a degree of cover, but also a convenient platform for cleaning rabbits. Half way over, a big rabbit was feeding part hidden by the rough ground of the warren, too far for a safe shot to hand, but not visible from ground level. Changing direction I hoped to come up from behind, but it saw me and bolted for the ditch along the edge of the field. As that opportunity faded, another arose in the shape of another bunny emerging 100 yards away. Getting down, there was a clear shot with the extended bipod and sent the little .17 ballistic bullet on its way to claim another for the pot. The farmer’s attempts at filling the burrows was a wasted effort, these spring rabbits full of energy and able to reconnect with the existing underground tunnels. 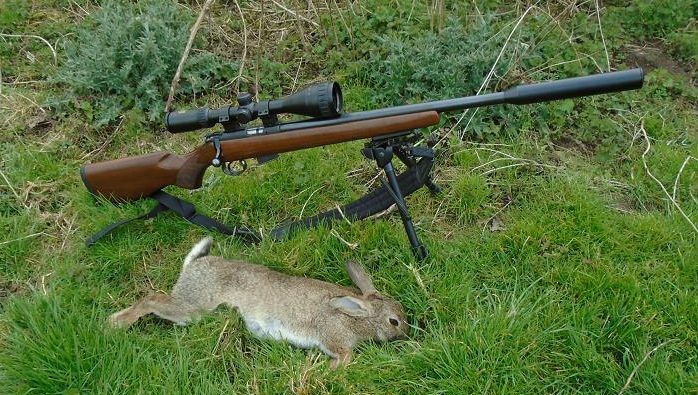 Back at the fallen tree, I began preparing the rabbits for bagging, looking around every now and then for new targets, being interrupted by the sight of a deep brown buck leaving the safety of a burrow to feed in long grass. 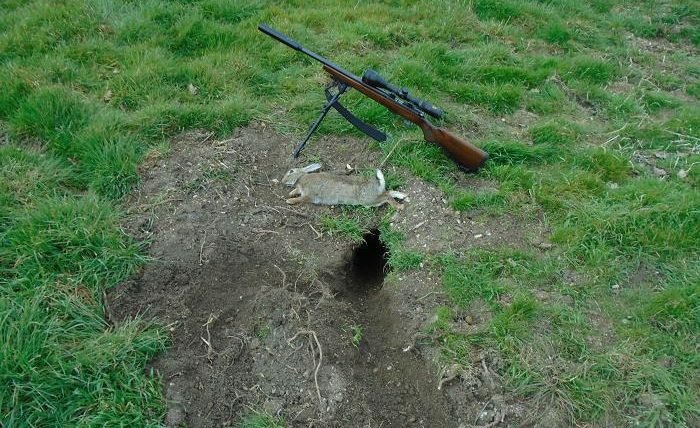 Only its ears were visible and I shut down the bipod to rest on a fence post, aiming into the grass to where the head should be. Squeezing off the shot at 80 yards, the animal cartwheeled forward out of sight and I climbed through the barbed wire to collect it. Well out of range, back toward the farm, I could see three more rabbits feeding near some willows and walked steadily in their direction. 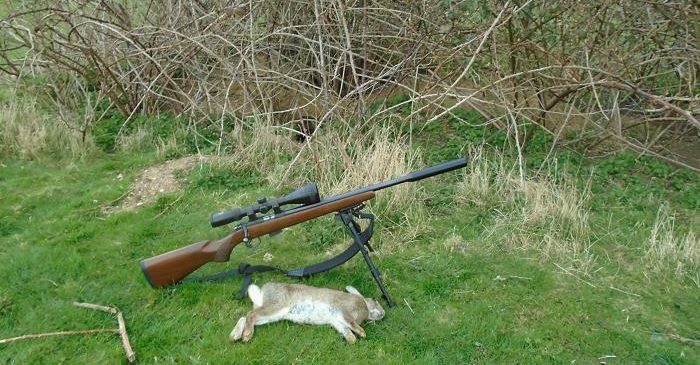 On my last visit I had taken a successful shot at over 160 yards, but they had all filtered back into the undergrowth long before that this time. 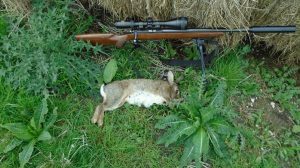 Taking advantage of the fact that the rabbits had their heads down, I moved in closer to about 120 yards, settling down into a shallow depression in the uneven field and waited. The sun had come out and I watched a red kite wheeling over the farm, making its shrill call. Spring is on its way. Movement beneath the willows got my attention. A pair of rabbits began chasing around. As I said spring is in the air. One came out on its own. No breeze to worry about. Cross hairs on, squeeze and it toppled over. Another healthy doe to carry back to the fallen tree for cleaning, then the half mile trek back to the van ladened down with the day’s harvest. 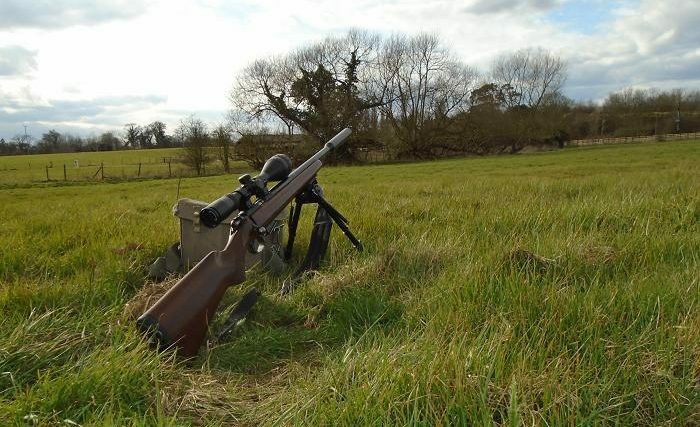 Once more the accuracy of the CZ 452 HMR had proved its worth.